Aaron Morgan (25) from Basingstoke, a successful disabled racing driver and Production BMW Championships Competitor, has been appointed Event Ambassador for the 2016 Mobility Roadshow, incorporating Get Going Live! (Silverstone Circuit, Northants, 26-28th May). Organised by charity Mobility Choice, the free-to-attend Mobility Roadshow is the UK’s premier consumer focussed event for people of any age living with restricted mobility. Being held at Silverstone for the first time, visitors have the unique opportunity to test drive adapted and wheelchair accessible vehicles (WAVS) around the famous motorsport circuit. Plus, inside the Silverstone Wing, a diverse showcase of mobility products, including wheelchairs, scooters and trikes, will be available for hands on demonstrations. The Mobility Roadshow displays the largest range of specialist adapted driving controls at any UK event focused on independent mobility. Aaron is delighted to be an event ambassador once more, having already successfully carried out the role at the 2015 Donington Mobility Roadshow. He joins a team of selective supporters who have benefitted personally from visiting the show and who proactively raise awareness of the event that helps disabled people with discover life-changing solutions. With Aaron’s interest in motorsport, he is thrilled that The Mobility Roadshow will be making its debut at Silverstone this year – allowing visitors to experience accessible driving on the famous Grand Prix Circuit. He is also a keen advocator of the Get Going Live! feature which focuses on specific needs of young and novice drivers with disabilities, age 15 plus. Opening up a new world of driving to younger generations, Get Going Live! provides free test drives in the safe presence of a professional driver, the chance to try an impressive range of adapted controls and even take a mock theory test. 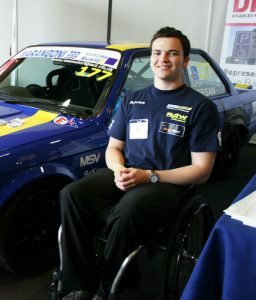 Be the first to comment on "Disabled racing driver appointed Mobility Roadshow Ambassador"